Enabling remote desktop mode is extremely easy on Ubuntu since Dapper. 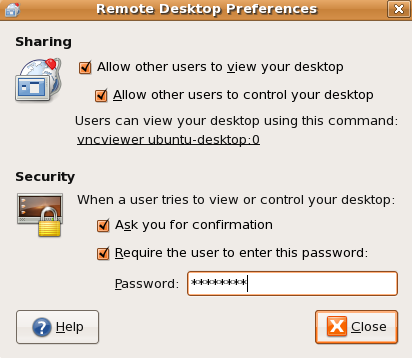 You can allow other users to access your desktop using the VNC Viewer utility that is bundled with Ubuntu, or offered as a free download for Windows. 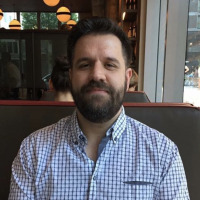 Note that enabling remote control of your desktop is never a safe thing to do unless you have a firewall installed and configured correctly, and even then is still a potential security problem. Now that you’ve been warned of the risks, let’s move on. Navigate to the System \ Preferences \ Remote Desktop on the Gnome top menu. The first two checkboxes need to be checked in order for remote desktop to be enabled. The Security section is important: If you select the “Ask you for confirmation” code, then you will need to be at the computer in order to allow the other person to access your desktop. If you are trying to remotely access one of your own computers, you will want to uncheck this box. The second checkbox should always be checked, and you should enter a secure password. You will be prompted for this password when you try to log on.